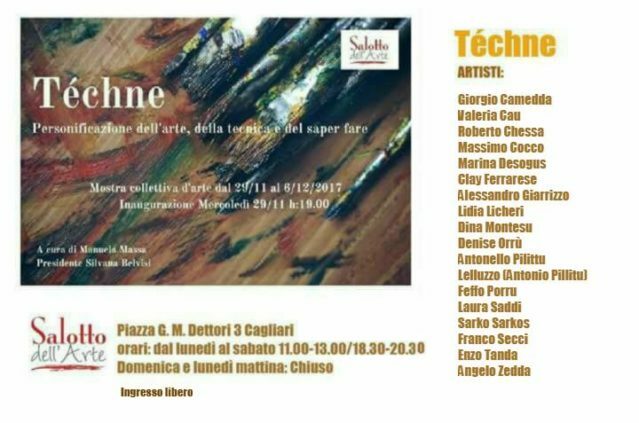 Tèchne is the title of the new art exhibition at the Salotto dell’Arte Art Gallery in Cagliari, Sardinia. Tèchne. An ancient greek word that signifies art as a the ability of making not only physical things but also being good at intellectual disciplines. Also Téchne is the greek goddess personified spirit of art, craft and technical skill. This entry was posted in Paintings Exhibitions and tagged Art Gallery, Contemporary Art, Modern Art, Modern Paintings on 30 Novembre 2017 by Roberto Chessa.